After CT and MRI scans, the medical team of an 84-year-old patient made an alarming discovery: Where much of the man’s right frontal lobe of his brain should have been, there was simply a large blank space. The 84-year-old man arrived in the emergency room with complaints that weren’t uncommon for a patient his age. He had reported feeling unsteady over the past several months, culminating in repeated falls in recent weeks. In the three days leading up to his hospital visit, his left arm and leg had noticeably weakened. Still, there were no red flags in the man’s medical history. He didn’t smoke. He rarely drank. A blood test detected nothing abnormal. In other words, doctors thought, there was nothing apparent that would have suggested a clear reason for his symptoms. In a way, they wouldn’t be wrong. 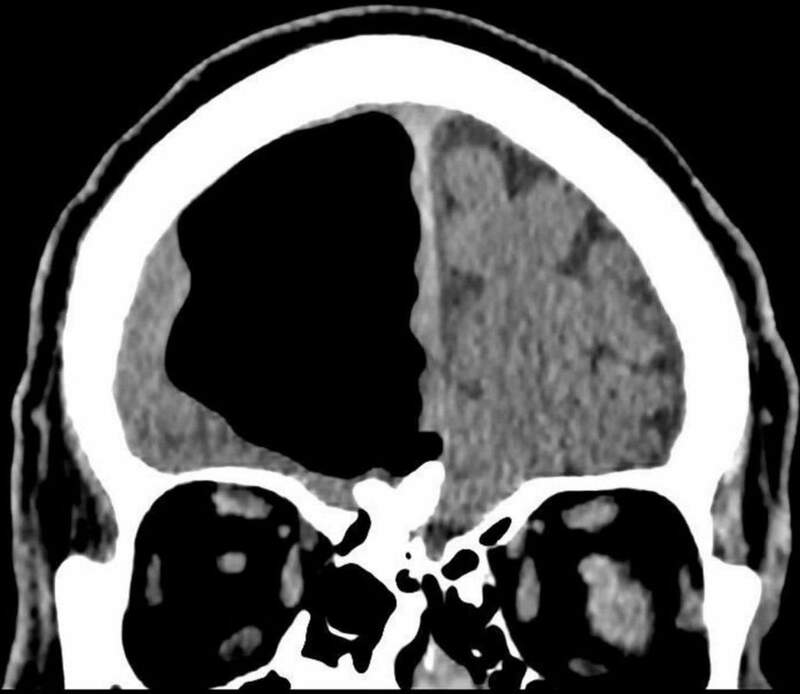 It was only after CT and MRI scans that the patient’s medical team made an alarming discovery: Where much of the man’s right frontal lobe of his brain should have been, there was simply a large blank space. Finlay Brown, a physician who was working in the emergency department at Causeway Hospital in Coleraine, Northern Ireland, at the time, remembers reviewing the brain-imaging scans with the rest of the staff. “(We) were all very perplexed by the images we saw!” Brown told The Washington Post in an email. The scans were so extreme, doctors wondered if the man had forgotten to disclose previous brain surgery or birth defects. He said he had not. It turned out the man had pneumocephalus, or the presence of air in his cranium, a condition that is found in “nearly 100 percent of cases after brain surgery,” Brown said. It can also occur after sinus infections and head or facial injuries - but with pockets of air or gas that are far smaller. In this case, the patient’s pneumatocele - or pressurized air cavity - measured about 3 1/2 inches at its longest, according to the BMJ Case Reports article. “In my research for writing the case report I wasn’t able to find very many documented cases of a similar nature to this one,” Brown told The Post. The pneumatocele’s likely cause, an MRI would show, was an osteoma, or benign bone tumor, that had formed in the man’s sinus and was eroding through the base of the skull, Brown said. The tumor’s formation and location had allowed for something of a “one-way valve effect” that had gradually contributed to the cranial air cavity, he added. The air cavity was also reported as a “rare cause” of a small stroke the man had suffered, which had likely led to the left-side weakness and other symptoms that prompted the man’s hospital visit, according to the BMJ Case Reports study. Brown said the patient could have undergone surgeries: One that would decompress the air pocket in his head and another that would eliminate the tumor that had created the “one-way valve” and allowed air to move into the cavity in the first place. However, the man declined both, because of his age and other health factors. He was given medication to prevent a secondary stroke and sent home with orders to monitor whether his left-side weakness worsened. His nonsurgical approach is not without risk: It’s likely the patient will be at a greater risk for infection, since there remains a passageway for air - and therefore bacteria and viruses - into his brain cavity, Brown said. “Unfortunately, as there are not many cases published, it is hard to know the exact prognosis,” Brown said. So far, though, the man appears to be doing well, despite the cranial air pocket. During a follow-up appointment 12 weeks after his hospital visit, the patient reportedly no longer felt weakness on his left side and “remained well,” according to his case study. Brown told LiveScience he wanted to publish this case study to stress “the importance of thorough investigation of even the most common of symptoms,” as an octogenarian’s frequent falls and imbalance could have easily been written off. “Because every now and then, there will be a rare [or] unknown causation of these that could be overlooked,” he told the science news site.